The Special Children – Lily, Ava, Andy, Jake and Sam, gathered at Cold Oak. 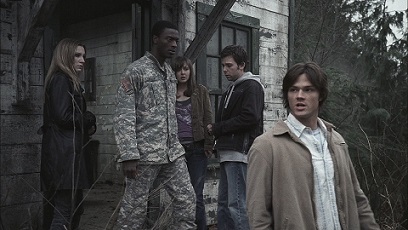 “Special Children” is the name used by fandom to describe those children who, like Sam, were chosen by the Yellow-Eyed Demon to take part in the Apocalypse. All were visited on their sixth month birthday by Azazel, and all develop some form of psychic power. Ash discovered that four had their mothers killed during these visits in 1983. His purpose in entering the nurseries of these children is revealed in 2.22 All Hell Breaks Loose: Part Two, when he shows Sam a flashback to the night of Mary Winchester's death. The demon drips demon blood into baby Sam’s mouth, whose eyes flash yellow. There is a group of Special Children born in 1983, which includes Sam. However, in 1.21 Salvation, Rosie, who is six months old, is introduced, and the Yellow-Eyed Demon makes allusions to other generations of Special Children (2.21 All Hell Breaks Loose: Part One). The Special Children appear to maintain their powers as long as Azazel was still alive, but with Azazel's death in 2007, Sam appears to have lost his powers and the only way he could utilize them again was to practice using his powers extensively or consume demon blood to strengthen them. It can be assumed that it would have been the same for the other Special Children if any others survived. The known Special Children are listed below, along with their original powers. Andy Gallagher – Telepathy - Places images in others' heads. Ansem Weems / Weber – Non-verbal mind control. Ava Wilson – Demon control (possibility of other powers). Jake Talley – Mind control (possibility of other powers). Sam Winchester – Telekinesis/exorcise/restrain/torture/kill demons with mind (only possible via ingestion of demon blood; Azazel's death may have led to this being a necessity). Before his death in 2.22 All Hell Breaks Loose: Part Two, Azazel spends a number of months bringing Special Children from Sam's generation to the deserted haunted town of Cold Oak, South Dakota in order to pit them against each other in fights to the death. He claims that he wants one of the special children to lead his demon army in a war against humans. Of more immediate importance is the need for one of the Special Children to open the Devil's Gate in Wyoming, because a demon cannot cross the giant Devil’s Trap made by Samuel Colt made from Iron railway lines. At Cold Oak, Lily and Andy are killed by an Acheri Demon controlled by Ava. While Ava is the reigning victor after five months of fights between the other Special Children, she is killed by Jake Talley. Jake agrees to help Azazel, hoping to one day kill the demon. However, he must first kill Sam, whom he stabs in the back. Dean makes a deal to resurrect Sam, who in turn kills Jake in a confrontation in Fossil Butte Cemetery. This makes Sam the sole survivor from his generation. In 3.04 Sin City, a demon named Casey reveals that she expected to follow Sam's lead in the next phase of Azazel's plan. In 4.03 In the Beginning, Dean is sent back in time, and it is discovered that back 1973 Azazel made pacts with various young people in Lawrence, Kansas. However, these pacts were not for souls, but for entrance into their homes in ten years time. He also tells the youths that as long as he is not interrupted while he is in their homes, no one will be harmed. This explains why some of the psychic kids did not lose their mothers or have a house fire: in those homes the demon was not interrupted. Azazel tells Dean that the deals are a sort of demonic "red tape", and that they enable him to enter the houses for the purpose of bleeding into the children's mouths. Azazel also reveals that his goals are much bigger than finding the leader for a demon army. It appears that Azazel hand picked every parent. He needed the parents of his psychic kids to be "strong." Azazel was not after Mary originally, but rather one of her friends Liddy Walsh. It wasn't until Dean interfered and brought the Campbells into the picture that she caught Azazel's eye. He kills her family, then John, to corner Mary into a deal to bring back her fiancé. In 4.22 Lucifer Rising, during a flashback to 1972, Azazel makes several human sacrifices at a convent as a means of contacting Lucifer. During the conversation, Lucifer instructs Azazel to find a "very special child." During this episode, Sam, high on demon blood, becomes strong enough to psychically kill Lilith, thereby breaking the final seal and freeing Lucifer. At the end of 5.03 Free to Be You and Me, Lucifer comes to Sam in a dream. He reveals that in addition to killing Lilith, Sam was brought to the convent to serve as Lucifer's vessel once he was released. He refers to Sam as his true vessel. During 5.21 Two Minutes to Midnight, Castiel reveals that Lucifer's vessel needs to have been prepared with demon blood, which strengthens the vessel to the point at which it can contain him. When Team Free Will arrive at Detroit in 5.22 Swan Song, Sam drinks gallons of demon blood to prepare himself to become Lucifer's vessel as part of a plan to imprison him in the Cage once more. At this point, Sam is able to kill two demons instantaneously and effortlessly. While his initial attempt failed, Sam is eventually able to take back control of his meatsuit and use the Horsemen Rings to imprison himself along with Lucifer, Michael, and Adam, stopping the Apocalypse. Although the plan for the Devil's Gate was not revealed until the battle began, rumors of the Special Children spread through the hunter community due to the residents of the Harvelle's Roadhouse overhearing Sam and Dean talking with Ellen, Jo and Ash. This results in Gordon Walker becoming convinced that Sam and others are destined to turn on humanity, prompting the vendetta that would lead to Gordon being turned; Gordon's ally Kubrick becomes convinced that God wants Sam dead due to a series of bad luck caused by a rabbit's foot. When Jake Talley embraces his powers and starts to use mind control, his irises flash a deep gold color for a brief moment. After consuming an entire vessel's worth of demon blood, Sam's eyes turn completely black whilst using his powers to kill Lilith. This page was last edited on 19 March 2019, at 07:24.